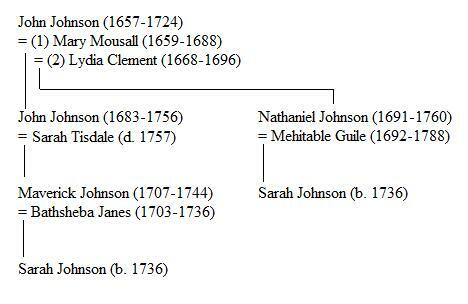 The family charts that I had on this part of my family were prepared by friends of my great-grandparents nearly 100 hundred years ago, and while I have verified much of this information over the years and corrected some data, I had never verified anything beyond Sarah (Johnson) Eaton. The charts had claimed she was born in 1736, the daughter of Nathaniel and Mehitable (Guile) Johnson of Killingly, Connecticut. However, in looking at the information on Nathaniel and Mehitable, I learned they moved to Stafford, Connecticut (not that far away), and in the Stafford Vital Records there was a record of marriage on 28 July 1757 between Sarah Johnson and Moses Hall, and some published genealogies had claimed this was the daughter of Nathaniel and Mehitable. Which Sarah was their daughter? I ultimately concluded, after reviewing further records, that Sarah, daughter of Maverick and Bathsheba, was most likely my Sarah, and that the other Sarah (daughter of Nathaniel and Mehitable) had indeed married Moses Hall in Stafford. However what was more interesting was seeing a very long line of twins in this family. This Sarah, daughter of Maverick and Bathsheba, had a twin sister Mary. Their father Maverick Johnson had twin sisters Mary and Lois in 1713. There are not any twins in the family of Maverick’s father John’s family. His mother Sarah Tisdale had several siblings, although their dates of birth were not recorded, so it’s not possible to know if there were any twins there. The same goes for the siblings of both of Sarah’s parents – James Tisdale and Mary Avery. But from 1713 to 1828, there are at least four examples of twins over five generations. The last set of twins died the day they were born in 1828 and I have not found another example of twins among their siblings’ descendants. John Charles Gile, The Guile – Gile – Guiles Genealogy (Baltimore: Gateway Press, Inc., 1997), 17. 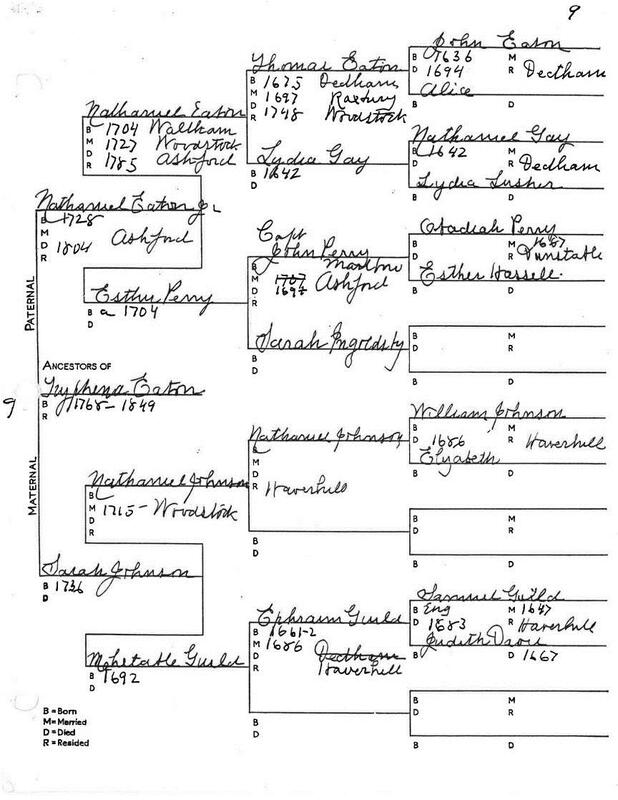 Eleanor Johnson Baker, A Genealogy of the Descendants of William Johnson of Charlestown, Massachusetts (Newburyport, Mass. : Newburyport Press, 1969). 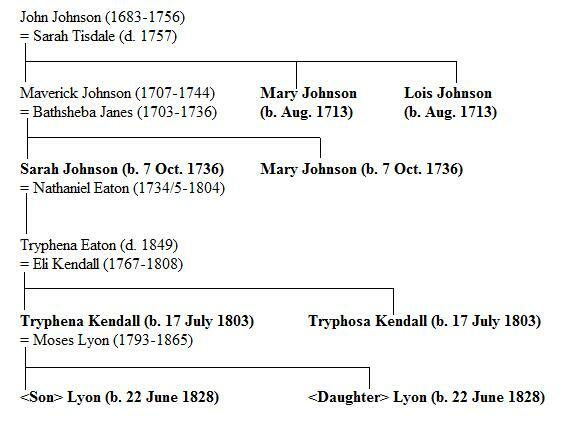 Also, this Nathaniel Johnson was not the son of an earlier Nathaniel, as the chart above claimed, but the son of John and the great-grandson of William and Elizabeth Johnson, identified incorrectly on the chart above as Nathaniel’s grandparents. Chris – if these are the same “Johnsons” we share in common it could account for my own evil twin daughters! 🙂 Good stuff. Thanks for the post! 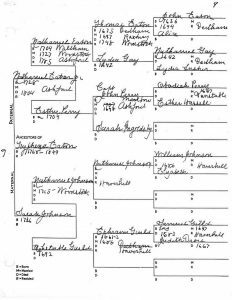 My family tree on my Mum’s side (Robert Harrington of Watertown) has more than 32 pairs of twins. The twinning even continued into the 1920s when my great aunt had a set of boys.Since I am still delving into the Harrington tree, I anticipate there will be more. Happy Hunting! My paternal great grandfather was a triplet, his mother was a twin, and two of her uncles were twins (her father’s brothers). I also have a great grandfather on the maternal side who was a twin. We have not had any other multiple babies in the family since my great grandparents. My second great-grandfather and his wife had a total of 16 children, of which 4 died young. There was also 3 sets of twins born, but one of each set of twins died, for a total of 7 children dying young. My older half-sister had twins, but they were identical, which is something that just happens.